Excitement growing for start of 21U world championship that will help finalise elite group of 2015 'Premier 12' nations. LAUSANNE, Switzerland -- The world governing body for baseball, the World Baseball Softball Confederation (WBSC), unveiled a global collection of National Teams for the inaugural 21U Baseball World Cup that will be staged next month in Taichung, Taiwan from 7-16 November. Added anticipation and excitement has been building for the start of the 21U Baseball World Cup because it is the final global competition before announcing the twelve qualified teams for "The Premier 12", the new flagship, pro-player international baseball tournament that will be launched in 2015 and feature the world's Top 12 ranked nations and award US$ multi-millions in prize money. In a further boost to the launch, visibility, and success of the newest world championship baseball platform to be rolled out under the WBSC, agreements have been reached to securelive television production for nearly half the games, with additional distribution deals to expand coverage, including global distribution via online and mobile platforms expected to be announced imminently. "The broadcast and TV coverage of international baseball and softball competitions and events both drives and builds on the growing appeal of baseball and softball to young people in schools and in communities, among TV audiences, and in the growing list of sponsors," said WBSC President Riccardo Fraccari. The Baseball/Softball family under the WBSC, along with other sports federations, are awaiting the outcome of the International Olympic Committee's review -- to be announced in December at a special Session in Monte Carlo -- on the process for adding/dropping sports to the Olympic programme, which may allow a new opportunity to have the bat-and-ball's Olympic status restored in time for inclusion at the 2020 Olympic Games in Tokyo, Japan, where baseball and softball are leading national sports and are supported passionately at all levels of Japanese society. The first-ever 21U Baseball World cup will feature five of the Top 10 ranked baseball nations in the world and eight nations within the Top 15. All nations heading to Taichung are ranked among baseball's Top 30, of WBSC's 141 Member Nations. Forty-three games have been announced for the 2015 21U Baseball World Cup, which will be centred around the modern venues of Douliu Baseball and Taichung Intercontinental Baseball Stadium, the latter of which will host the Opening and Closing Ceremonies. Days 1 - 5 will see twenty-five games of round robin action, followed by a rest day, and teams will be battling to finish among the top three nations of their respective groups in advance into the "Super Group". Days 7, 8 and 9 will feature the top three finishers from Group A colliding with the top three finishers from Group B in the elite nine-game "Super Round-Robin". The Super Round Robin is a continuation of the opening round-robin, as head-to-head matches and win/loss records against Super Group members carry over from the opening round robin. The nations not advancing to the Super Round Robin will be grouped together to battle for 7th - 12th place in the Consolation Round Robin. Day 10: The top two teams escaping the highly-competitive and intense Super Round Robin to finish at the top of the Super Group Standings will play in the gold medal finale on Sunday, 16-Nov, while the third- and fourth-place teams will play for bronze. No. 11 Italy, No. 13 Mexico, and No. 15 Australia will all be looking to use a high-pressure performance in Taichung to help slide into position among the "Premier 12" nations, while No. 12 Panama, who will not be present, will likely be pushed out of the Top 12. Only 72 points separate No. 11 Italy from No. 15 Australia -- and 100 points will be awarded to the 21U world champion. •	Gold = 100 pts. •	Silver = 80 pts. •	Bronze = 60 pts. •	4th = 30 pts. •	5th = 26 pts. •	7th = 18 pts. •	9th = 10 pts. •	10th = 6 pts. •	11th = 2 pts. 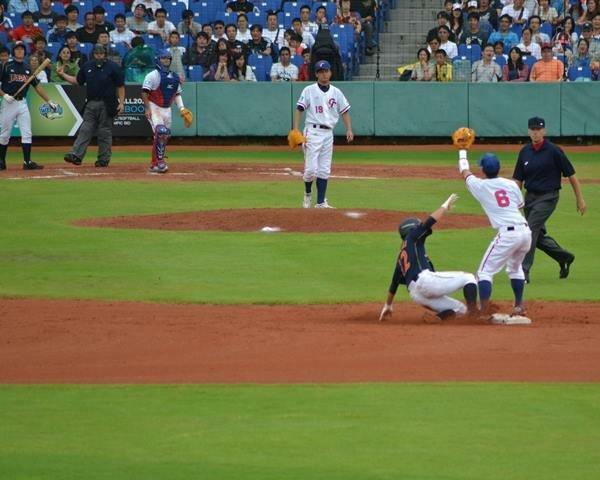 National Teams will be allowed to carry six 23U players on their 21U Baseball World Cup 24-man rosters, which will further strengthen the competition level. Teams will be able to make use of a maximum of three 23U players in the line-up at the same time. 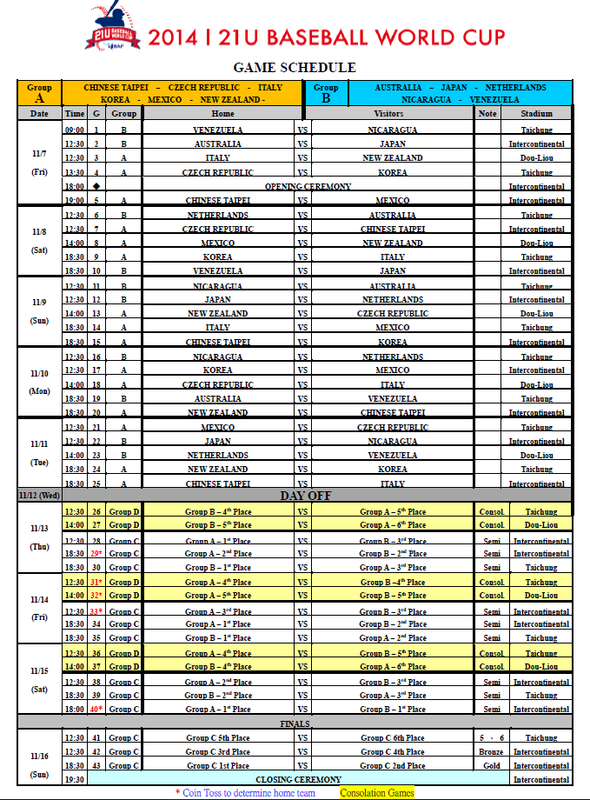 Following the first-ever 21U Baseball World Cup, the event will be played every two years, with the hosting rights of the next edition in 2016 having been awarded to Sinaloa, Mexico, which recently delivered a highly successful 15U Baseball World Cup.